Performing arts occupy a distinct place in Kerala’s heritage. The various art forms are intertwined with the culture of the land and are blended with the lives of the people; the art forms were born out of the rich culture of Kerala. 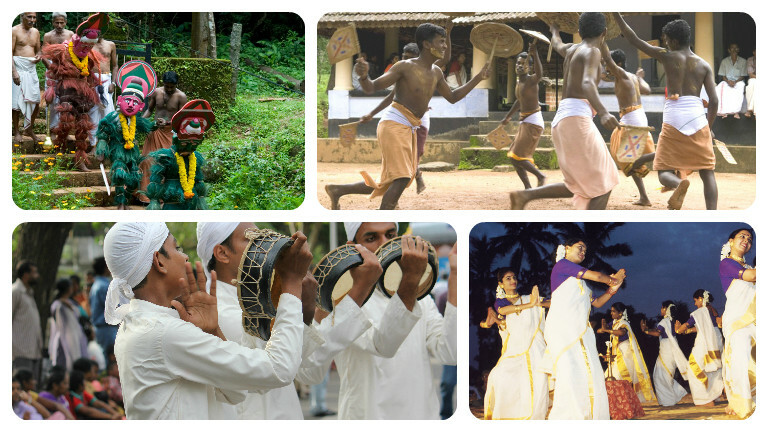 A modest attempt is made to introduce the varied performing arts of Kerala, ranging from the unique Kutiyattam, the Kerala version of the Sanskrit dance – drama to Kathakali, Kerala Natanam and other classical art forms. Kalamezhuthu, Sarpam thullal, Theyyam are still preserved without losing their essential essence and charm. Velakali calls to mind the interest in warfare of ancient Kerala. Together with the art forms of the tribal’s, all the classical and ritual art forms provide the art buff both aural and visual delight. These art forms are in every sense timeless, i.e., beyond space and time in their uniqueness.